Many of us rack our brains thinking of what side dish to make for chapathi. It has to be flavorful, different and healthy too. I prefer to make curries that has lots of vegetables in it and this kadai vegetable curry is a one perfect curry as its loaded with veggies. I noted down this recipe from a cookery show and adapted it to suit our taste buds. Kadai vegetable curry is a delicious and healthy side dish for chapathi and even jeera pulao and ghee rice. The gravy itself is creamy without the addition of any cream or cashew paste. The freshly roasted and ground kadai masala added at the end enhances the flavor of this curry. The cooking process may seem long but trust me its simple and the outcome will be a restaurant quality dish at home. Serve hot with any Indian flat bread or pulao. Cook the vegetables until soft and tender. Dry roast the above ingredients until nice aroma comes. Cool and grind to a slightly coarse powder. Heat oil and add onions and capsicum. Toss them till they become but still retain some of the crunchiness. Remove and set aside. Add tomatoes and toss for a minute and set aside. Heat oil, add cinnamon, cardamom and cloves and fry for a minute. Then add onions and fry till the edges turn brown. Add ginger-garlic paste and saute till raw smell goes. Then add tomatoes and cook till they become soft. Cool and grind to a smooth paste. Heat oil in a kadai and add the cooked cauliflower, beans and carrot. Fry them for 3-4 minutes. Then add the onion, tomato and capsicum. Add ground onion-tomato masala, salt and ½ cup water. Cover and cook for 5 minutes. Then sprinkle the kadai masala and mix well. Close and cook for another 2-3 minutes. Make sure the vegetables are not overcooked or mushy. The kadai masala powder must be ground slightly coarse. Wow ! 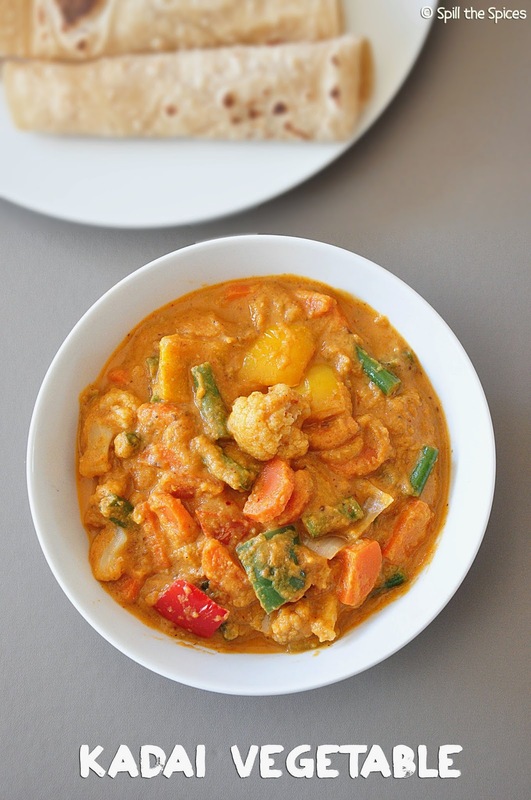 so delicious vegetable curry .. Healthy and yummy vegetable bowl.. Love to have it with chappati.. Delicious and creamy gravy with a healthy assorted vegetables. Nice clicks. 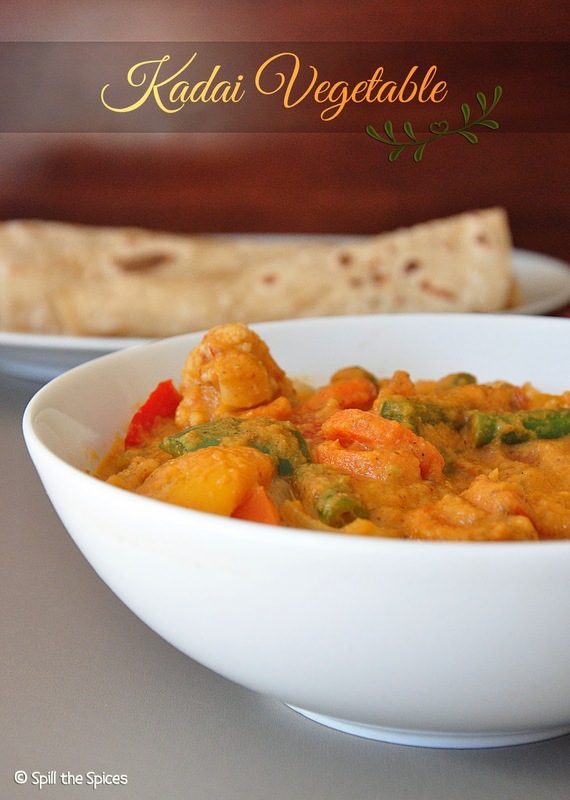 Healthy and delicious curry, perfect with chapathi. luks co creamy n Yummy...tempting cliks. love this recipe. the gravy looks so creamy and yum. 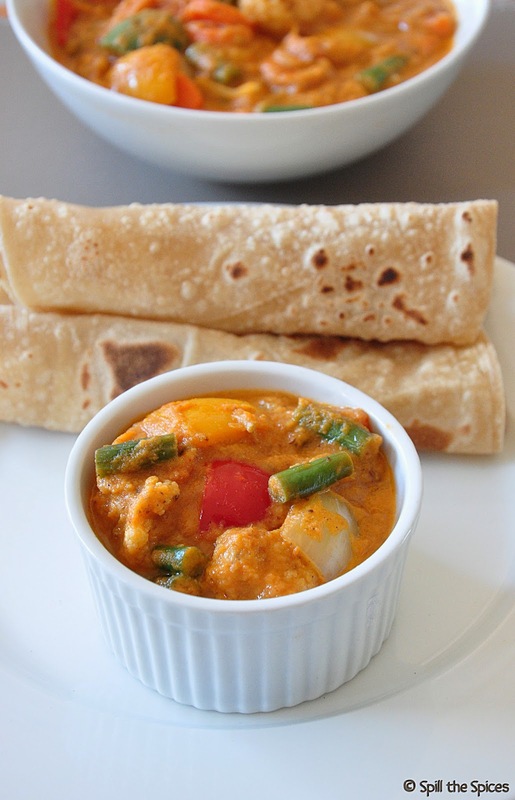 Love the recipe,creamy and yummy curry,will try this. Wow!! love those creamy looking kadai veggies!! Colour of the dish itself makes me drool,soo creamy and irresistible. Nice way to eat veggies i say!! Lovely clicks..